Hundreds of workers of the Samsung mobile company on Saturday protested here, demanding salary hike and change in shift timings, police said. The workers assembled on the premises of the company's office in Noida Phase-II in the morning and remained there till around 10 pm, they said. Samsung representatives could not be contacted immediately for a response. "The protestors were demanding that their work timings which have been changed since January, be restored to the previous pattern. They were also peeved over changes in holidays, food and other such issues. These issues were reportedly discussed with the management and resolved," Circle Officer, Noida 3rd, Shwetabh Pandey, said. "The workers were also demanding a hike in their salaries, which the management has reportedly said was a policy issue and needed more discussion," he told PTI Saturday night. Pandey said there did not arise a law and order situation and no disruption to traffic happened as the protestors had assembled within the premises of the private company. 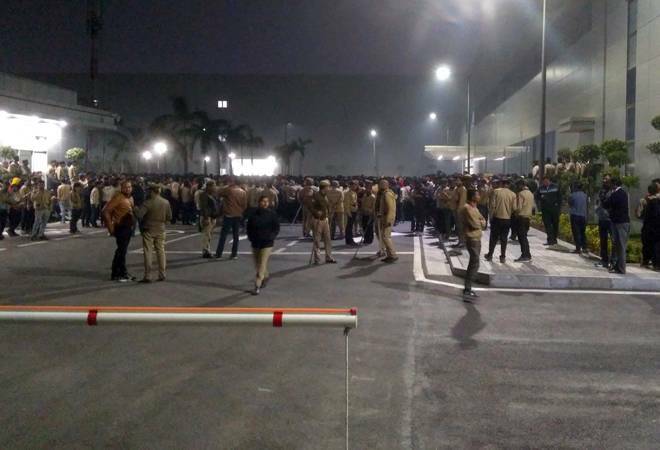 The Samsung plant, inaugurated by Prime Minister Narendra Modi in July 2018, has witnessed similar protests in the past also. Nearly 500 farmers, belonging to different outfits such as Sanyukta Kisan Parishad, Kisan Sabha, had staged a protest outside the company's office in October demanding "more jobs for the local youth". In August, at least 80 people were arrested during a protest at the plant for a similar reason, according to officials.